This dog carries two copies of Eg which allows for the production of black pigment and results in a grizzle coat color pattern. However, this dog’s coat color is also dependent on the K, A, B, and Em genes. A grizzle coat color pattern is only produced if the dog does not have an Em variant (i.e., does not have a melanistic mask) and is also ky/ky for the K locus and at/at for the A locus. This dog will pass on Eg to 100% of its offspring. This dog carries one copy of Eg and one copy of N which allows for the production of black pigment and results in a grizzle coat color pattern. However, this dog’s coat color is also dependent on the K, A, and B genes. A grizzle coat color pattern is only produced if the dog does not have an Em variant (i.e., does not have a melanistic mask) and is also ky/ky for the K locus and at/at for the A locus. This dog will pass on Eg to 50% of its offspring and N to 50% of its offspring. This dog carries two copies of N which does not result in a grizzle coat color pattern. The dog will pass on N to 100% of its offspring. The Eg variant of the MC1R gene produces a characteristic coat color pattern consisting of a black pigmented widow's peak on the head of the dog with other black tipped hairs on the back of the dog similar to some sable or saddle tan colorations. The grizzle coat color pattern has only been observed in the saluki, Afghan hound (referred to as "domino" in this breed) and the borzoi (referred to as "sable" in this breed). 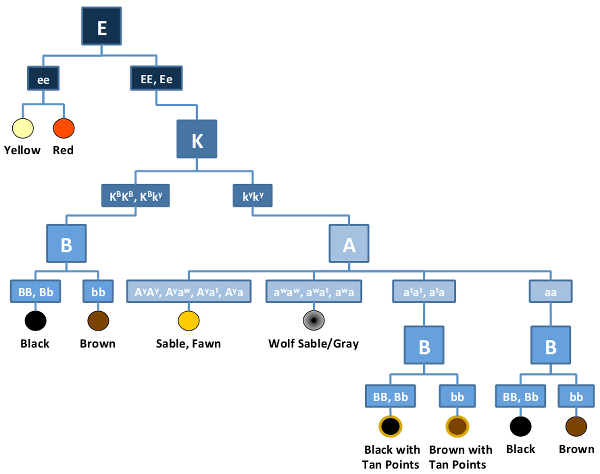 Although the Eg variant of the MC1R gene is dominant to E and e, it is recessive to Em (melanistic mask). Therefore, the grizzle coat color pattern is only expressed if the dog does not have an Em variant (i.e., does not have a melanistic mask) and is also ky/ky for the K Locus and at/at for the A locus. The grizzle coat color pattern in some breeds of dog is inherited in an Autosomal Dominant manner meaning that dogs only need to inherit one copy of Eg to have the characteristic grizzle patterning. In addition, grizzle patterning is only produced if the dog has a ky/ky genotype at the K Locus and an at/at genotype at the A locus. However, Em is dominant to Eg so grizzle dogs cannot carry any Em alleles. Dogs with an Eg/Eg genotype will have a grizzle coat color if the above conditions are met and will pass on Eg to 100% of its offspring. Dogs with only one copy of Eg will pass on Eg to 50% of their offspring and will produce puppies with grizzle coat color patterns approximately 50% of the time depending on the genotypes at the Em, K, and A loci of both partner dogs. Non-grizzle dogs can be bred to other non-grizzle dogs or dogs with disqualifying Em, K, and A genotypes to produce non-grizzle dogs.